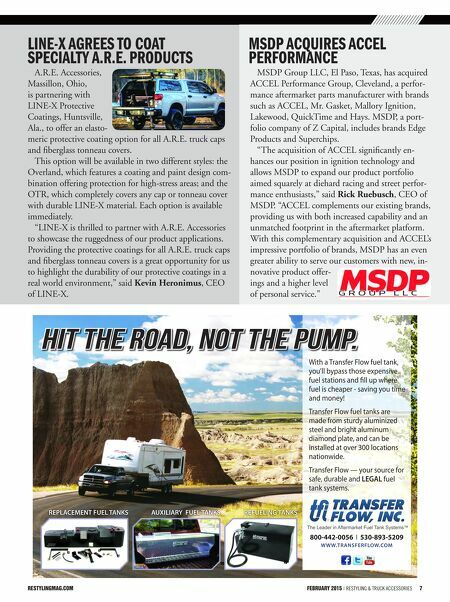 restylingmag.com FEBRUARY 2015 | Restyling & tRuck AccessoRies 7 LINE-X AgrEEs to CoAt spECIALty A.r.E. produCts A.R.E. Accessories, Massillon, Ohio, is partnering with LINE-X Protective Coatings, Huntsville, Ala., to offer an elasto- meric protective coating option for all A.R.E. truck caps and fiberglass tonneau covers. This option will be available in two different styles: the Overland, which features a coating and paint design com- bination offering protection for high-stress areas; and the OTR, which completely covers any cap or tonneau cover with durable LINE-X material. Each option is available immediately. "LINE-X is thrilled to partner with A.R.E. Accessories to showcase the ruggedness of our product applications. Providing the protective coatings for all A.R.E. truck caps and fiberglass tonneau covers is a great opportunity for us to highlight the durability of our protective coatings in a real world environment," said Kevin Heronimus, CEO of LINE-X. REPLACEMENT FUEL TANKS AUXILIARY FUEL TANKS REFUELING TANKS 800-442-0056 I 530-893-5209 W W W.TR ANSFERFLOW.COM With a Transfer Flow fuel tank, you'll bypass those expensive fuel stations and ll up where fuel is cheaper - saving you time and money! Transfer Flow fuel tanks are made from sturdy aluminized steel and bright aluminum diamond plate, and can be installed at over 300 locations nationwide. Transfer Flow — your source for safe, durable and LEGAL fuel tank systems. The Leader in Aftermarket Fuel Tank Systems™ HIT THE ROAD, NOT THE PUMP. Msdp ACquIrEs ACCEL pErforMANCE MSDP Group LLC, El Paso, Texas, has acquired ACCEL Performance Group, Cleveland, a perfor- mance aftermarket parts manufacturer with brands such as ACCEL, Mr. Gasket, Mallory Ignition, Lakewood, QuickTime and Hays. MSDP, a port- folio company of Z Capital, includes brands Edge Products and Superchips. "The acquisition of ACCEL significantly en- hances our position in ignition technology and allows MSDP to expand our product portfolio aimed squarely at diehard racing and street perfor- mance enthusiasts," said Rick Ruebusch, CEO of MSDP. "ACCEL complements our existing brands, providing us with both increased capability and an unmatched footprint in the aftermarket platform. 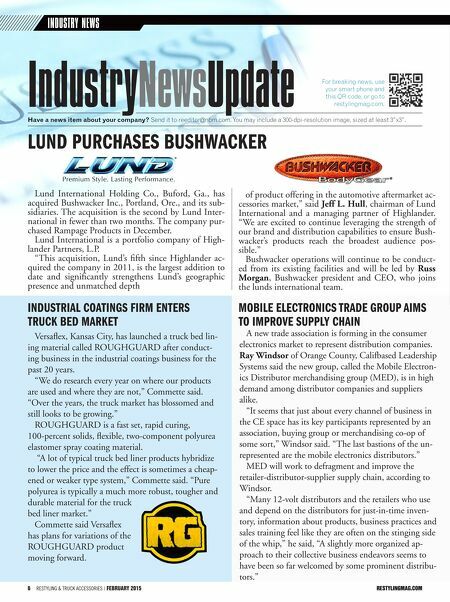 With this complementary acquisition and ACCEL's impressive portfolio of brands, MSDP has an even greater ability to serve our customers with new, in- novative product offer- ings and a higher level of personal service."